"Parents, teachers, and administrators are all concerned that America's kids are stressed out, checked out, or both--but many have no idea where to begin when it comes to solving the problem. That's why the work of Challenge Success is so urgent. It has created a model for creating change in our schools that is based on research and solid foundational principles like communication, creativity, and compassion. If your community wants to build better schools and a brighter future, this book is the place to start." "Challenge Success synthesizes the research on effective school practices and offers concrete tools and strategies that educators and parents can use immediately to make a difference in their communities. By focusing on the day-to-day necessities of a healthy schedule; an engaging, personalized, and rigorous curriculum; and a caring climate, this book is an invaluable resource for school leaders, teachers, parents, and students to help them design learning communities where every student feels a sense of belonging, purpose, and motivation to learn the skills necessary to succeed now and in the future." "Finally, a book about education and student well-being that is both research-based and eminently readable. With all the worry about student stress and academic engagement, Pope, Brown and Miles gently remind us that there is much we already know about how to create better schools and healthier kids. Citing evidence-based 'best practices' gleaned from years of work with schools across the country, they show us what is not working, but more importantly, what we need to do to fix things. 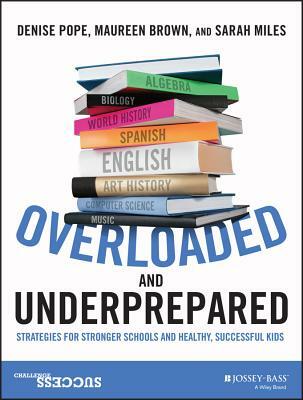 Filled with practical suggestions and exercises that can be implemented easily, as well as advice on how to approach long-term change, Overloaded and Underprepared is a clear and compelling roadmap for teachers, school administrators and parents who believe that we owe our children a better education." "This new book from the leaders behind Challenge Success provides a thorough and balanced exploration of the structural challenges facing students, parents, educators, and administrators in our primary and secondary schools today. The authors' unique approach of sharing proven strategies that enable students to thrive, while recognizing that the most effective solutions are tailored on a school-by-school basis, makes for a valuable handbook for anyone seeking to better understand the many complex dimensions at work in a successful learning environment." DENISE POPE, PHD, is a senior lecturer at the Stanford University Graduate School of Education and the co-founder of Challenge Success. MAUREEN BROWN, MBA, is executive director for Challenge Success, where she oversees daily operations as well as marketing and strategic planning. SARAH MILES, M.S.W., PHD, is director of research for Challenge Success. She researches how schools and classrooms can best support student learning and engagement.